Who needs Price to Win? Some industries bid repeatable products and services; the competitors pricing strategy is observable from historic data. Price to Win is for those of us that don’t have this luxury! For example, several Defence, IT & Transport bids are bidding for one-off projects that have no historic precedent. This methodology is for you if price might equal something other than cost plus profit margin. If you accept that costs are not black and white, then prices are a deeper shade of grey. Why? Because these bids effectively form a baseline that nearly always changes. Furthermore, the customer’s assessment criteria often indirectly penalises certain types of pricing that may actually be better for the customer. If your competitors see an opportunity to play the system on pricing; you can be sure one will do it. 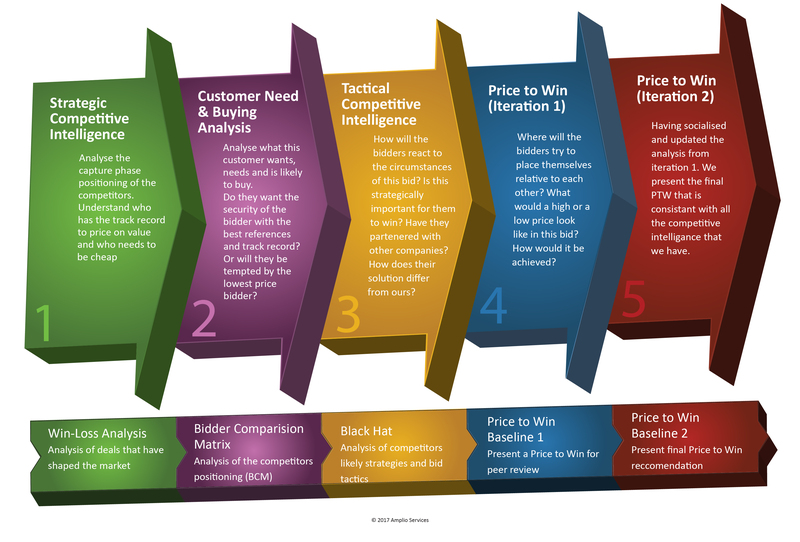 When starting a Price to Win, we actually need to begin in the realm of Competitive Intelligence. Actions are rarely random and our actions are constrained by several forces. We need to analyse those forces to understand what the options are before we can price them. Let’s say you go out to buy a car tomorrow, a hypothetical car dealer offers an Aston Martin or a Ford for the same price. How long is it going to take you to choose the Aston Martin? Why is this decision so predictable? Before you arrived at the dealer; Aston Martin & Ford had already embarked on very different strategies. They have different manufacturing processes, different marketing brands and entirely different cost structures. If the car dealer wanted to sell you the Ford, he needed to price it below the Aston Martin. Step 1 of our Price to Win methodology is understanding which bidder comes to the capture phase as Aston Martin and who arrives as Ford. They aren’t going to unwind the whole strategy and cost-structure for this one bid. This is the first constraining factor. They either have good references of similar work, or they don’t. They’ve either sold to this customer before, or they haven’t. They either have the capacity to deliver the work without expanding, or they don’t. Of the past ~10 bids we submitted to this customer, who did we compete against and what was our win / loss record? Of the last ~10 bids we submitted bidding against an incumbent supplier, what % of them did the incumbent win? Of the last ~10 bids we submitted to this customer, how many of them were awarded to the lowest price bidder? If you can answer these questions, you’ll quickly notice some trends. Do your Bid / No Bid decisions follow where these trends lead? By Step 3 we know what most competitors would prefer to offer and what the customer would prefer to buy. That doesn’t give us a price but first we need to consider the exceptions to the rules. There are so many tactical factors to consider that discussing these in a group review will quickly make your head spin. The key here is separating the things that really influence the outcome and the things that don’t. Often the information will seem to conflict. For example, you might hear that a competitor is going to be very aggressive on price because they see this as a ‘must win’. At the same time, you check their annual accounts to see they’ve run up losses for the last two years which suggests they will bid more conservatively. Which piece of information do you prioritise? Incredibly it’s only now that we can start Step 4 and actually model actual prices. This warrants an entire book to itself but the most valuable advice I can give is our Five Perspectives™ Methodology. We strongly advocate analysing each price driver from at least 3 of 4 possible perspectives. Each one will inevitably give you a slightly different figure. In doing so, you will gain much more accuracy in a narrow range and if one method stands out from the others, it usually contains an error. Once you put all these steps together; you’ll be able to produce an output similar to the diagram below. We are modelling different competitors and also different strategies they may pursue. Thankfully we can narrow this down to three generic strategies that work well (borrowed from Michael Porter). Furthermore, all three strategies won’t be available to all bidders so that makes this a more manageable task. The good news is that you can now benchmark a target and design your solution to fit. The bad news is that Price to Win is an iterative process. Your first benchmark rests on some assumptions about the customer behavior, competitor strategy and available data. You should go back to Step 2 and start iteration 2. This may sound soul destroying but you’ll see the bid through a different view this time. You can now literally put a figure on what you think value means to the customer. You’ll see that iterative 2 is not just a re-run of iteration 1. It asks new questions that further enhance the accuracy of our Price to Win. It’s here that we apply our Circumstance-Centered Estimating™ method which sanity checks your assumptions and drives accuracy. 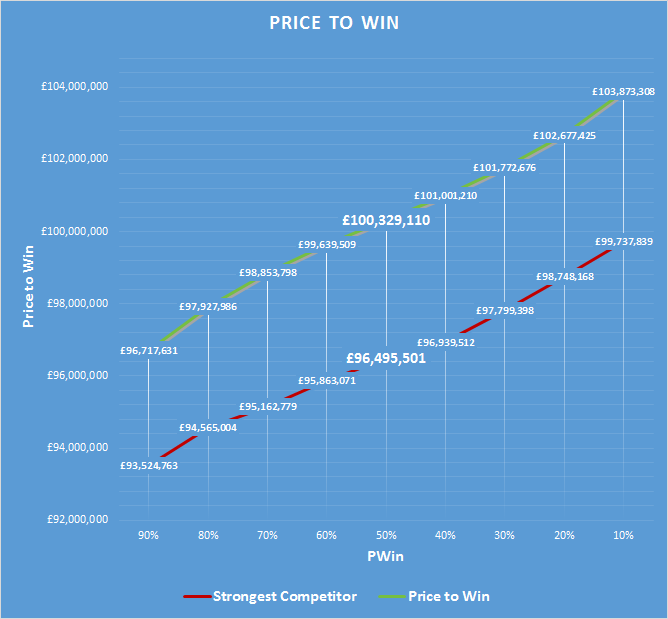 Price to Win is a logical, predictable & repeatable methodology. When you are good at it, 85% of your predictions will be >90% accurate. You need to collect and store accurate competitive intelligence before you can expect this level of accuracy. It is worth the investment. Cost drivers need to be estimated from different perspectives and checked with at least 2 iterations of a Price to Win. The consequence of not doing this will be a lower accuracy. If this sounds like a lot of effort, that’s because it is. But compare the cost of an analyst with the appropriate tools to the cost of losing bids for predictable reasons. The return on investment is very straight forward. This methodology isn’t for everyone or every industry. But for complex solutions, bespoke solutions and ‘must-win’ bids then there really is no down-side to doing this analysis. If you found this useful then click the link below to download our White Paper on Price to Win. 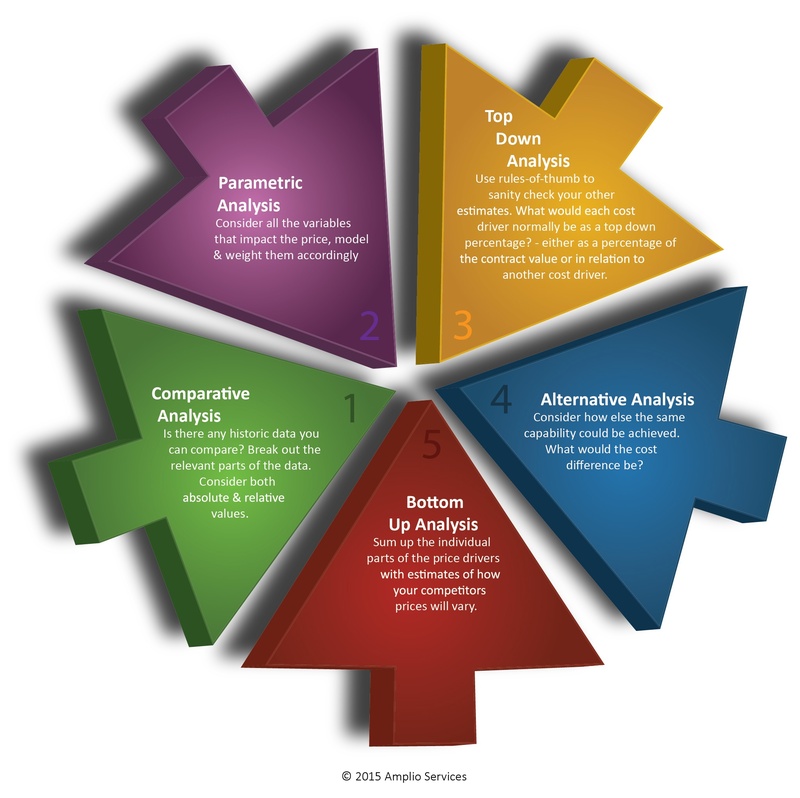 We offer Price to Win training to companies who want in-house analysts. We also provide Price to Win as a Service to companies looking for an external service to quickly provide best practice anlaysis.